Repeat visitors to our website will notice that our website has a refreshed look, new navigation options, redesigned news page and updated URL - www.willamettefallslegacy.org. 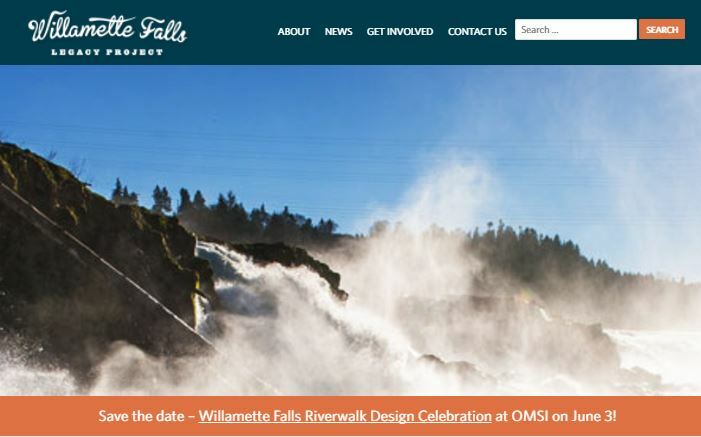 The website redesign coincides with our upcoming unveiling of Willamette Falls riverwalk design on June 3 at a community celebration to be held at OMSI and the beginning of a new phase for our project. The changes reflect our project's branding as the Willamette Falls Legacy Project and were designed to make the website more user-friendly. We are also linked to the new website for our project's nonprofit friends group, Rediscover the Falls, for those who wish to "become a friend"!